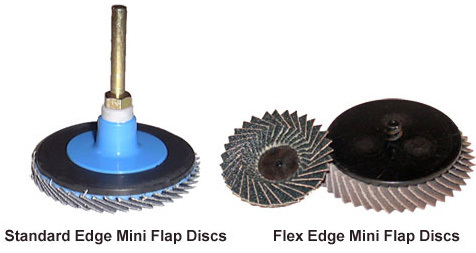 These flap discs are used with a small quick change Type R holder with a 1/4” straight shank. You can select either the standard edge T-27 discs (top of page) or the flex edge Type 27 (bottom of page). The standard edge discs offer the longest life, while the flex edge discs allow you to work in convex shapes and tight areas. These discs are all premium alumina zirconia. All mini flap discs on this page are for use with Type R quick change holders. You can purchase holders from our online store by clicking on backup pads in the left margin.